Our mission is to work in a collaborative partnership with students, a shared responsibility, where the adviser and student are equally invested in the educational process and holistic development of the student. Academic Advisement is available on a walk-in basis, so come in anytime to meet with an academic advisor. To maximize your valuable time, plan ahead and visit the Academic Advisement Center during non-registration periods . This site is maintained by Academic Advisement Center. 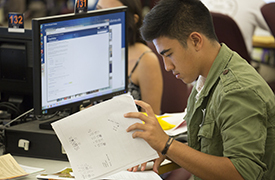 To report problems or comments with this site, please contact aactech@fullerton.edu.